Routledge Introductions to Applied Linguistics is a series of introductory level textbooks covering the core topics in Applied Linguistics, primarily designed for those beginning postgraduate studies, or taking an introductory MA course as well as advanced undergraduates. Titles in the series are also ideal for language professionals returning to academic study. The books take an innovative 'practice to theory' approach, with a 'back-to-front' structure. This leads the reader from real-world problems and issues, through a discussion of intervention and how to engage with these concerns, before finally relating these practical issues to theoretical foundations. Additional features include tasks with commentaries, a glossary of key terms, and an annotated further reading section. 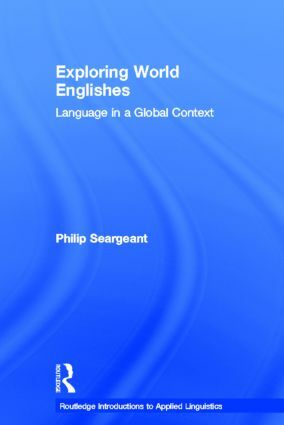 In this book Philip Seargeant surveys varieties of English existing within the world today, and the debates and controversies surrounding its present forms, functions and status in diverse world contexts. It examines how English has evolved to become a ‘global language’ and looks at the political and cultural history that has influenced this evolution. Beginning with a discussion of real-life challenges relating to world Englishes that are faced by language professionals – particularly in the contexts of language education and language planning – the book explores and illustrates the ways in which the actual use and management of English, as well as the beliefs and ideologies associated with it, play an increasingly important role in contemporary globalized society. Philip Seargeant is Lecturer in Applied Linguistics at The Open University, UK. He is the author of The Idea of English in Japan, editor of English in Japan in the Era of Globalization and co-editor of English in the World: History, Diversity, Change (with Joan Swann, Routledge and The Open University, 2012). The books take an innovative 'practice to theory' approach, with a 'back to front' structure. This leads the reader from real-world problems and issues, through a discussion of intervention and how to engage with these concerns, before finally relating these practical issues to theoretical foundations. Additional features include tasks with commentaries, a glossary of key terms, and an annotated further reading section.